Shopping in Northwood? Need a Coffee or Tea ? Just walk 50 paces along Oaklands Gate to Northwood Methodist Church Oasis Coffee Lounge and enjoy a choice of coffee, delicious home made cakes or toasted teacakes, scones etc at very competetive prices. Toy corner for children. Wifi access. 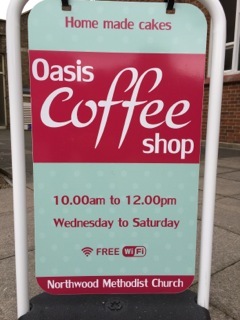 The Oasis Coffee Shop: is open at Northwood Methodist Church, Wednesday to Saturday mornings 10am until 12pm, serving tea, coffee, and gorgeous home made cakes – enjoyed by church members and visitors alike.